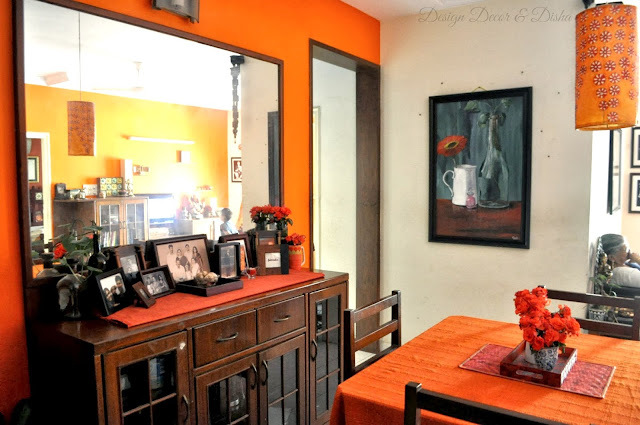 I received a request from a lovely reader of 3D to feature a home of a fellow blogger and a dear friend Padmamanasa. The request was so sweet and tempting that I couldn't resist asking Manasa if it was possible. Despite her super busy schedule, Manasa took out the time to send me some dazzlingly beautiful images of her strikingly beautiful home. 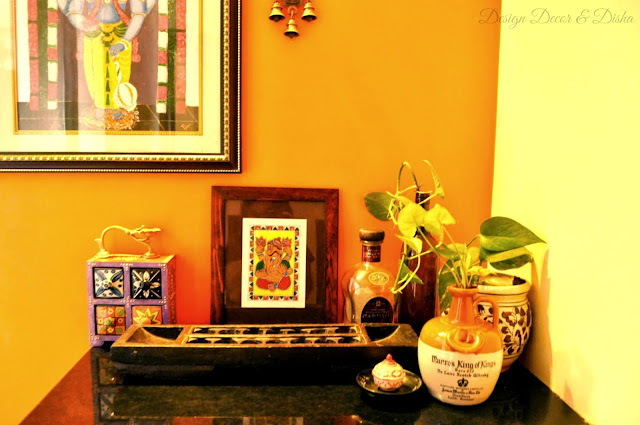 Manasa blogs sporadically at ForTheLoveOfSunshineCorners, a blog loved by all the decor enthusiasts and is quite addictive. 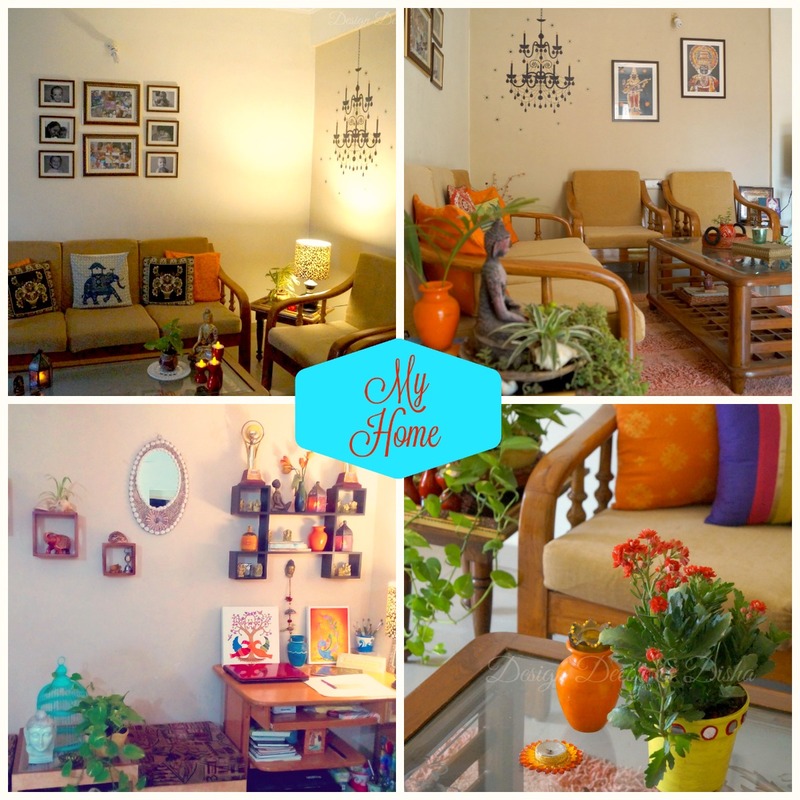 Here is a tête-à-tête with Manasa as she takes us through her collected, curated and most importantly a created home. 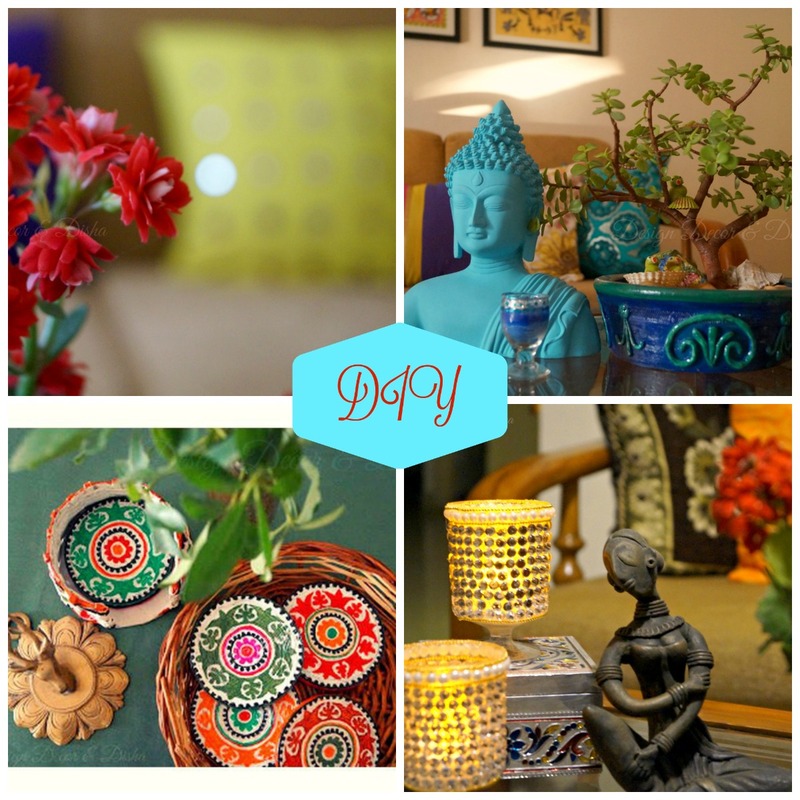 Thank you, Disha for featuring our home in my favourite decor and lifestyle blog - Design Decor & Disha. We live in a beautiful green city - Bangalore, India. We have been living in this work-in-progress home ,which we recreate every day, for past 12 years. Entrance to the home lends the cheerful and positive vibe. Dashavtar above the door frame was painted by her husband and Guruvaayoorappan painting in the foyer is also done by Manasa's extremely talented artist husband Pradosh Nair. Surprised!! Well, most of the paintings in their home are done by Pradosh. In case you are tempted to see more of his work, Blobs Of Rainbow is the blog where you can find his extraordinary work. Manasa is a person who is charming, warm and full of energy and her home is a true reflection of her personality. All the rooms have a feature wall painted in bold colours that exude warmth. 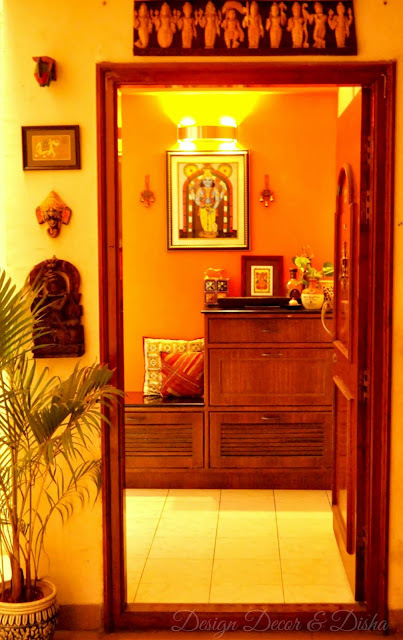 In the living room, orange wall sets a perfect backdrop for wooden cabinets and brass knick-knacks on them. Furnishings are complementing the wall colour and making the place look cohesive. A large Madhubani painting on the wall and a shelf that holds her breathtakingly beautiful collection of brass create a focal point in the living room. 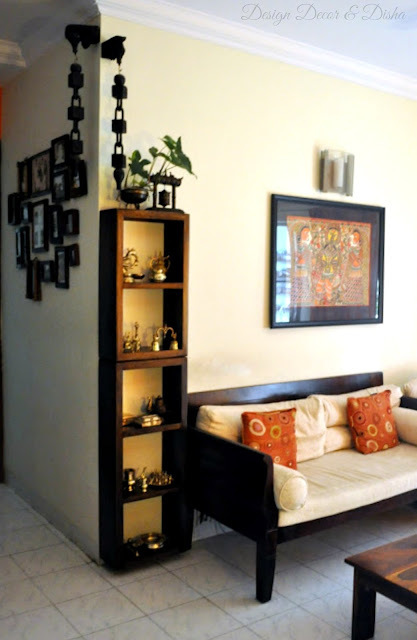 Manasa has a knack for adding a special home accent called 'life' and cleverly uses it to transform her space into an inspiring and elegant den. Do you know how it started all. 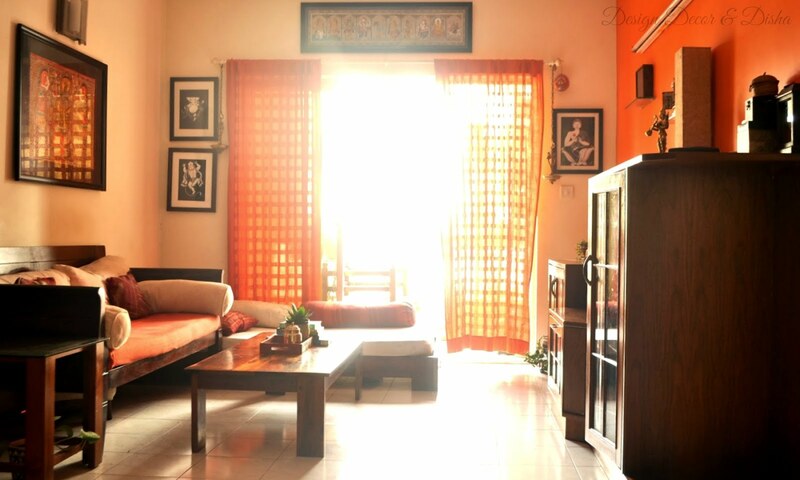 "I guess I shared the love for lovely spaces from my maternal uncle and my older brother. My older brother, who spent quite a few years in the middle east, came back with a lot of decor magazines. I remember drooling over these magazines for hours together as a school going girl. I guess the love for beautiful spaces started there." 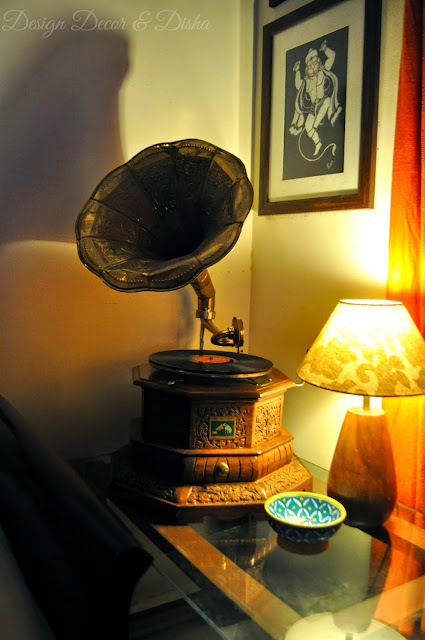 Manasa adds cheerfully that "What a pleasure it is to hear to old Bengali songs in an antique gramophone. It is a sheer bliss transporting us to re-independence era, I tell you!" 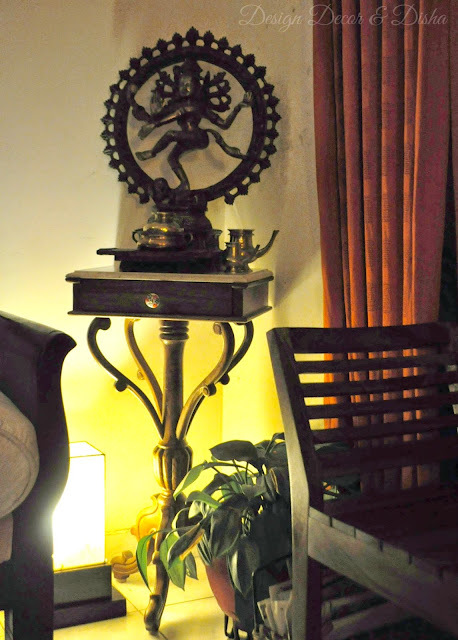 Nataraja statue graces the another corner of the living room. 'Beautiful' would be an understatement for this majestic idol. 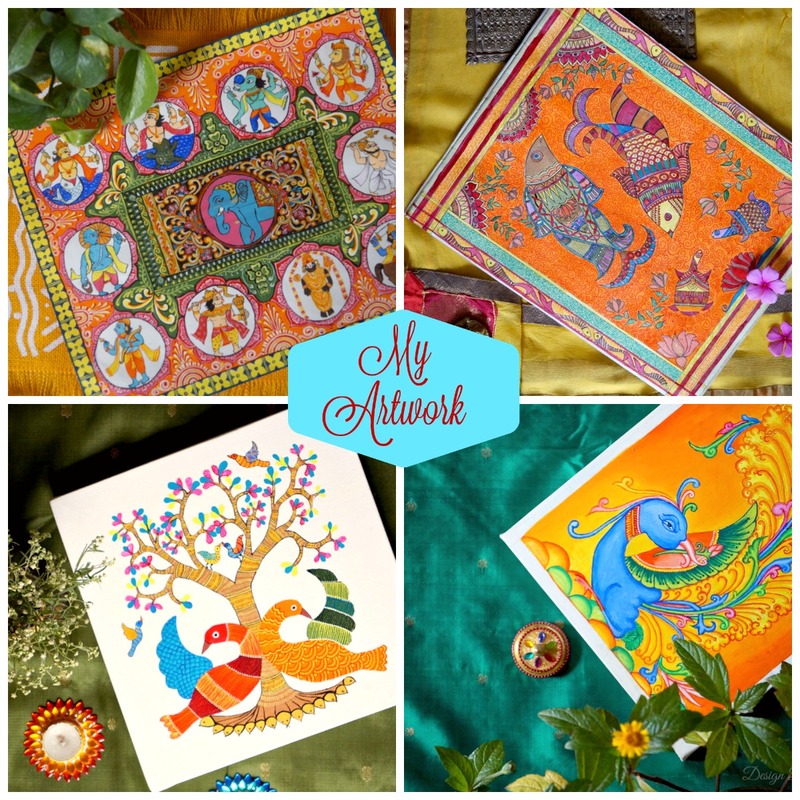 Manasa knows the decor philosophy quite well and has placed all the home accents in such a way that they offer a place for the eye to rest and admire the beauty of it. 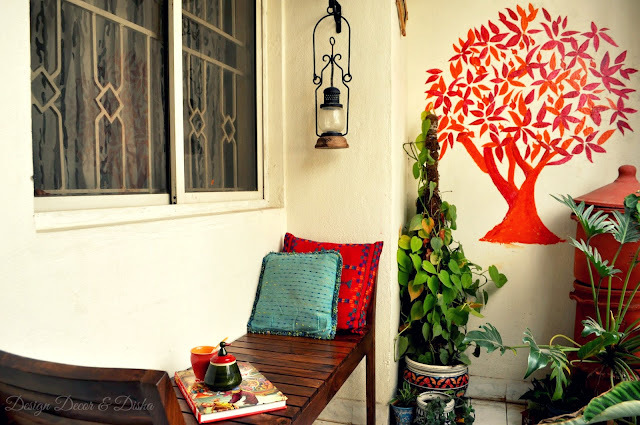 Manasa recalls her journey of decorating various homes she has lived in over the period of time, "fast forward to the hostel/ PG days when I moved to Bangalore/ Delhi. I spent a lot of energy and had loads of fun in decorating my space on shoe string budget! I spent quite a few evenings at Hauzkhas and Janpath Marg to set-up my tiny hostel room. Then came 2 bedroom rented space at Bangalore. This time, I had little more budget, as I moved from assistantship to salary :) Then came the current home. Beautiful display of family portraits in wooden picture frames bring striking elegance. It can easily bring back lots of memories and become a conversation starter while the family enjoys meals together. Spicing up the kitchen wasn't a big deal for Manasa. She is very creative and knows how to make things work and add style to any space. Paintings fill up the empty space making it lively and cheerful place to prepare meals for the family and a classic pendant light illuminate the kitchen in style. Did you notice the cute little step ladder in the corner. It holds all the recipe books, some knick-knacks and adds the aesthetic charm to the kitchen's interior. A colourful ceramic spice rack is what I am eyeing in the below image, it's beautiful beyond words. 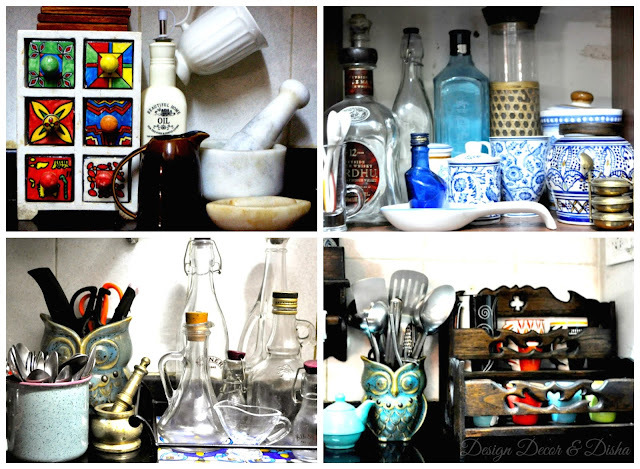 Manasa's collection of glass bottles, pestle and mortar, oil dispensers and blue pottery is exquisite. 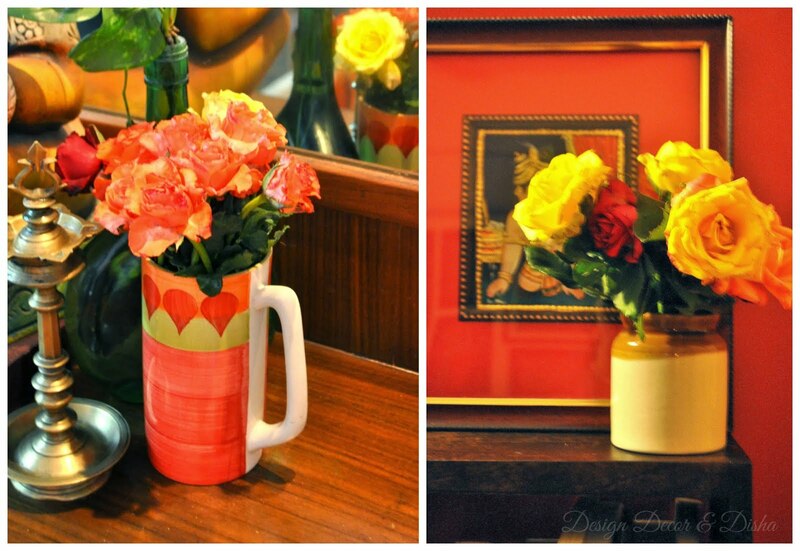 A beautiful wooden rack in the corner is used to display her collection of mugs in vibrant hues. Manasa wanted a red wall in her home and this is the bedroom where the feature wall is red and grabbing all the attention. This wall is close to her heart for one more reason, it holds felicitation for her father. 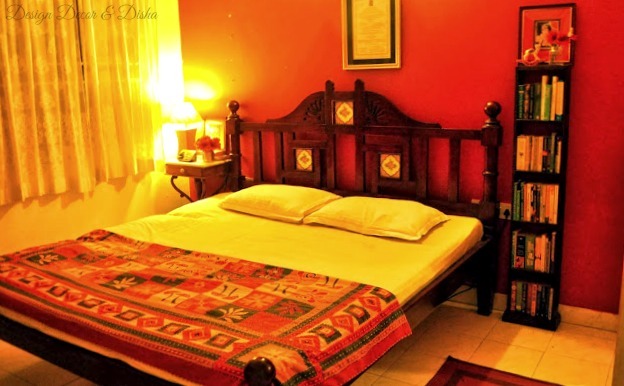 An antique teak wood bed that is more than 80 years old is the statement piece in the room. She has endless love for wood in a dark tone and vintage pieces. 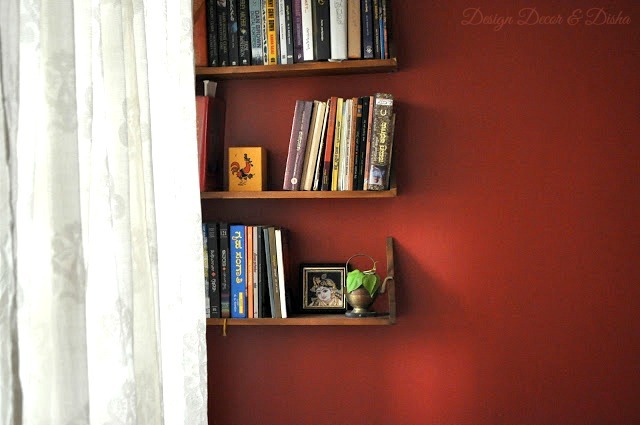 She has recently added these floating shelves on the same red wall to hold her ever growing collection of books. 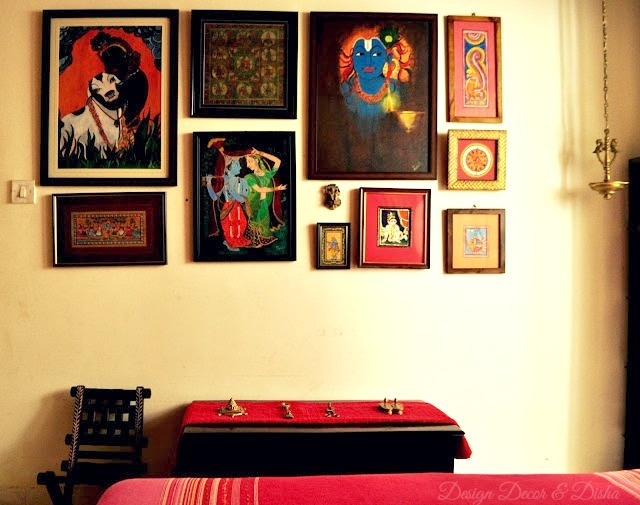 Opposite to the red wall is this beautiful gallery wall that houses alluring paintings done by her husband Pradosh. 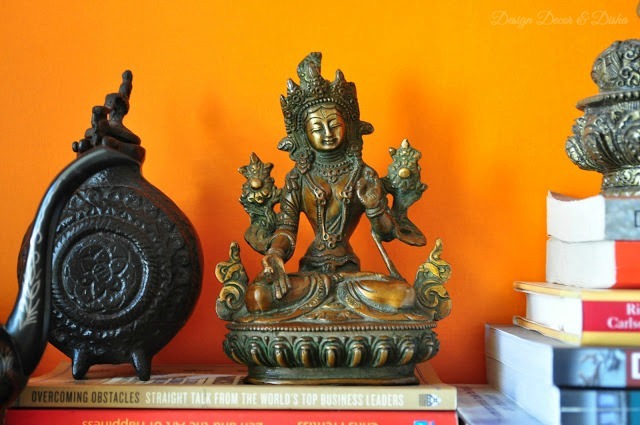 Adding extra pizzazz to the gallery wall is a hanging brass diya. Bedside table acts as a stage to display the decor accents in most fascinating ways. 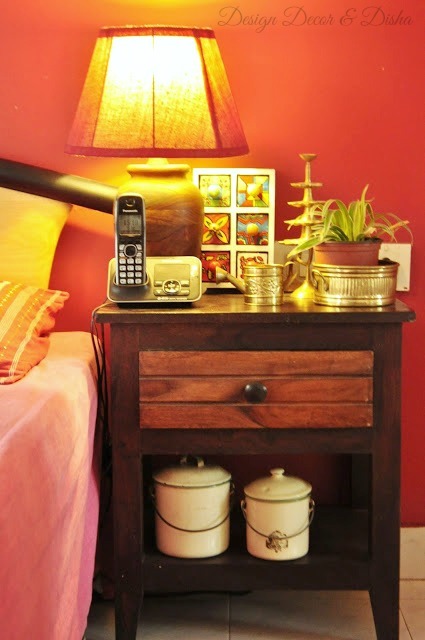 Manasa adds, "I can never spare my home from brass and solid dark wood." Below is a picture of their kids' room. 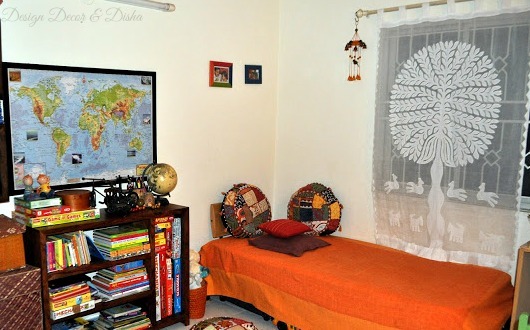 Manasa has done a great job in kids' room by placing wooden rack and baskets that provide ample storage. 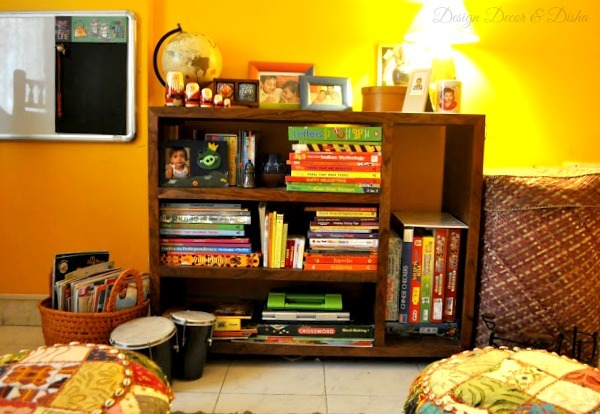 All the books and board games are well organised and styled in the shelf along with some toys and pictures of the kids. Applique work sheers on the window make the room look bright and dreamy. 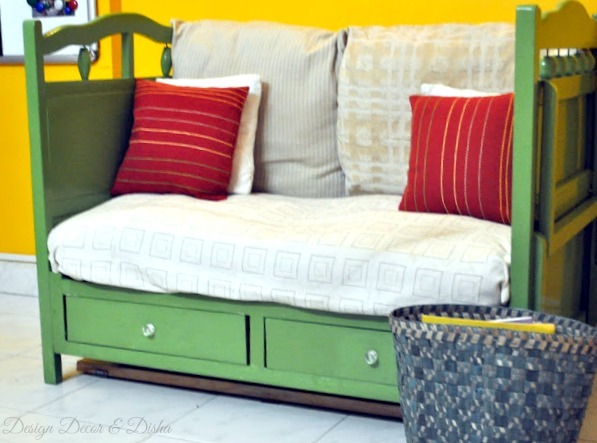 'Crib-turned-sofa' the most clever upcycling project is what I would call it. After their daughter had grown up the crib was lying unused at the one corner of the kids' room consuming the space. Manasa put her thinking cap on and this cutest and functional sofa for the kids was the result. I am a curator at heart and hubby is an artist! Our home has been the beneficiary of this!! (sometimes victim too :p). We have collected stuff over years and let gone off quite a bit. 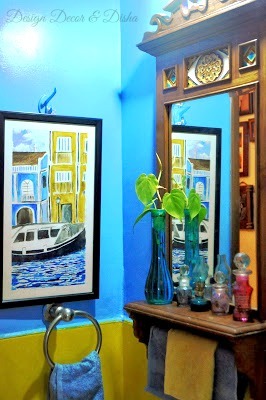 Both I & hubby are major fans of Goan architecture/ interiors/ sunny colours. We wanted to have a tiny goan corner at home for some time now. Hubby had presented a lovely tiled mirror for my birthday couple of years back. We had put this up at our hand wash corner. The colours were finalised, hubby zeroed in on ink blue colour. I was not particularly crazy about the beige backsplash tiles, that came with the home. I wanted sunny yellow coloured tiles instead!And voila the tiles were painted sunny yellow! This airy and breezy room is the master bedroom. Teal wall to add some calming effect in her sleep sanctuary. 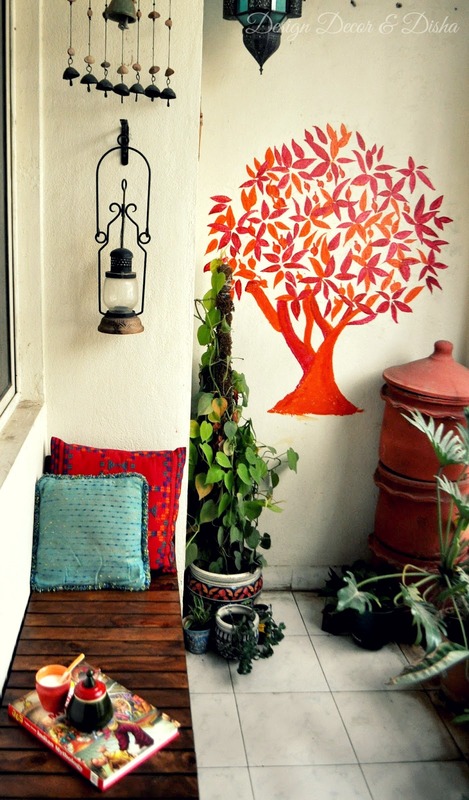 No space in her home is complete without the use of dark wood and painting by her husband. So their bedroom is no exception. A peaceful and attractive reading corner like this is every reader's dream. And here's the prize-winning balcony garden of Manasa. The beautiful mural on the wall you see is hand painted by her. Little tweaks done by the duo in their home are quite impressive and commendable. This home is a ground floor flat with ever so tiny terrace. Fairly spacious balconies. (Comparison here is to what I call as terrace :P).12 years ago, when the interiors guys did a fab job of making a home, an almost European one, little did he know what will become of his European interiors a few years later! 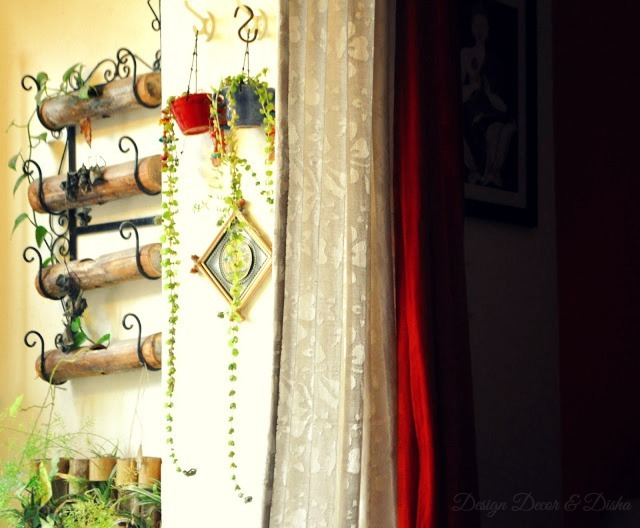 By now you all must have figured out that there has to be a piece of dark wood to quench Manasa's thirst for it and hence there lying a latt bench from Urban Ladder in her cosy and undisputedly gorgeous balcony garden. She chimes in that, "this is our favourite place to sit & watch Bangalore rains, to do the homework, to sit down and read a book for adults & babies alike at home!." Here is one more view of her balcony garden. Beauty flows from each and every corner of her home. Now for all the brass and bronze lovers out there, this is something for you too! I covet her stunning brass collection. Do you? Here is what she says about her passion for metals, "I feel the brass & bronze artefacts are timeless & add an old world charm to our place. 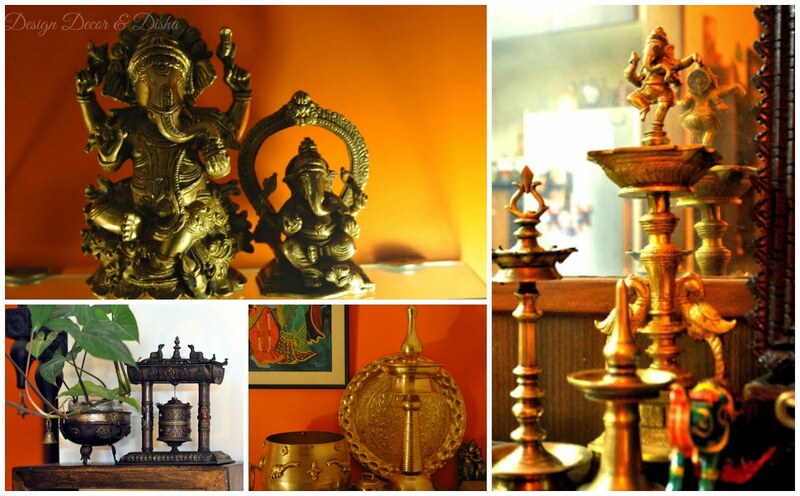 I love the yellow gleam of brass urlis, gindis, para & nilavilakku. I love the texture of bronze & the character the metal adds." This brass Tara idol is my favourite. It is so majestic and there is something mystical about this picture. 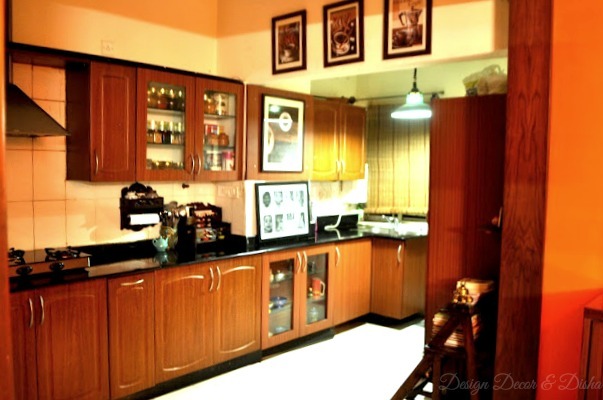 Manasa sums it up beautifully by saying, "I love the dark wood and creams and greens. Hubby loves the brass and colours. Son loves both and daughter is yet to decide! Our home, eventually what we love as family, believe our roots are and home is!" It is time to wrap up and say goodbye to you dear readers with few more pictures from Manasa's heavenly abode. Below are the links where you can check out exquisite images and story behind each piece that enhances the beauty of her home. Tempted to check out more home tours on my blog, here is a link for you. You can find me on Instagram here. I will be back in few days with something exciting about kitchen decor!! Happy Decorating and Stay Tuned! !